Here's an Animaniacs pose sheet of Wakko and Dot by Dan Haskett, one of the great animation artists who worked on the series. This batch of drawings comes from 1992, a year before the series aired, when Wakko did not yet have the whiskers added to his cheeks. 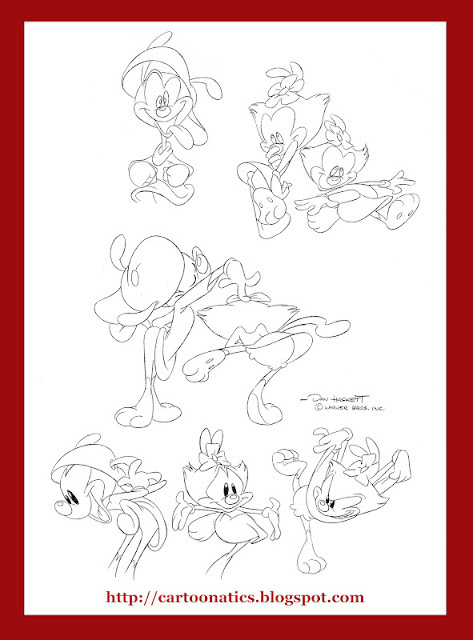 Dan joined other huge talents like Rich Arons, Ken Boyer, Lynn Naylor, Barry Caldwell, Alfred Gimeno and many others to bring life to the early inspirational drawings of Yakko, Wakko and Dot and the other Animaniacs cast members. I have three copy of pose sheets by Dan Haskett dated from 8 June 1992 revised with whiskers. This include Wakko and dot. This include also the revised version of the picture you have posted. Dan Haskett is one of my favorite animation artists of all time. Thanks for posting these, and please keep 'em coming! I had some of these pre-whiskers poses, on my Amiga way back when. Some of them had "empty" eyes too, as I recall. I do have a few now like this one, but none as old as the ones I had on the old computer. But I don't have any as high-res as this of course, as they were low-res scans back in the days before broadband! Dan's great. I always liked his animation segments he did for "Sesame Street" including the famous cat trying to open the catfood can short. Chester Phelph's Important New Video! Do you know what Mickey Mouse is whistling? Artwork & written material posted on "Cartoonatics" is (c) 2011 Tom Ruegger unless otherwise noted. Simple theme. Powered by Blogger.